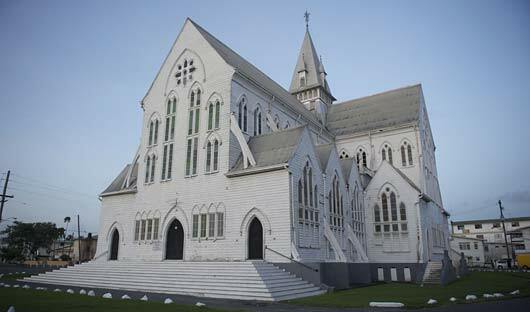 Arrive in Georgetown, the lively capital of Guyana which offers all the enjoyment of a Caribbean town without the crowds. The unique city is built below the high tide level and is protected by a large seawall drained by a grid of canals. Within the seawall the city boasts impressive Victorian and Dutch colonial architecture and enjoyable local markets. Begin the day early by heading to the extensive and beautiful Georgetown Botanical Gardens where, if you are lucky, will have views of the Blood-coloured Woodpecker. The gardens host an impressive array of rare birds such as the astonishingly colourful Veniliornis which is found only in the Guianas and even there almost wholly limited to the narrow coastal plain. 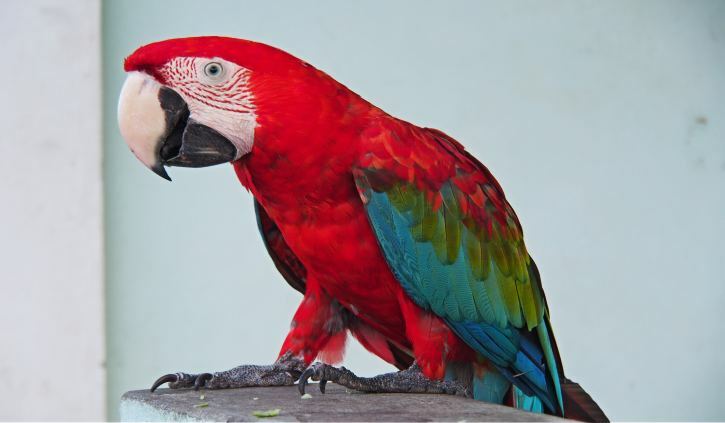 The gardens host Snail Kite, Gray Hawk, Pearl Kite, Carib Grackle, Red-bellied and Red-shouldered Macaw’s. You will walk on stunning trails in the back of the gardens where you may see Yellow-chinned Spinetail, Black-crested Antshrike, Silver-beaked Tanager, Buff-breasted Wren, Golden-spangled Piculet and Ashy-headed Greenlet birds. 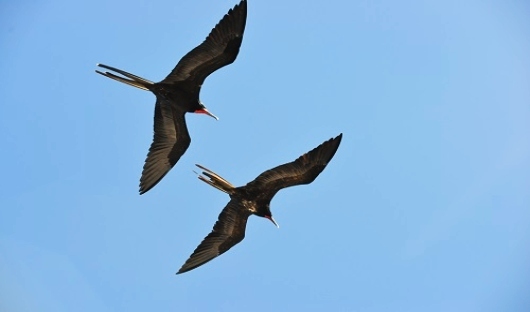 In the afternoon you will travel to the Demerara River and if the tide is out it will expose the mud flats which normally host feeding Scarlet Ibis, Little Blue and Tricolored herons, while Magnificent Frigatebirds take to the air and with the help of your guide will search for other shorebirds. Depart before sunrise with a packed breakfast, where you will travel eastward from Georgetown to Abary Creek Trail to look for Blood-coloured Woodpeckers and Rufous Crab-hawk, the last of the many range-restricted species that you will be hoping to find on this tour. You will also look for the little known White-bellied Piculet and Guianan Gnatcatcher, both of which can be found in this area. 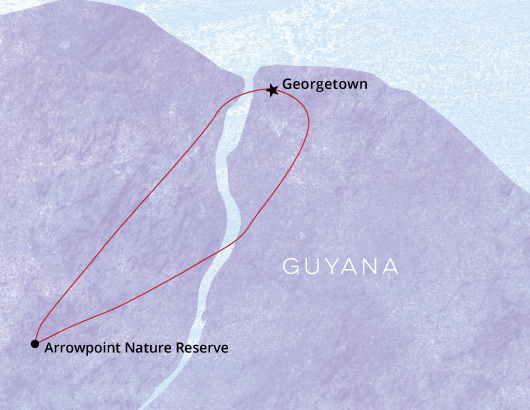 On your return journey to Georgetown, you will travel along the coast to the Mahaica River. You will board a boat on the river to see Guyana’s national bird the Hoatzin, which is found in abundance along this river system. 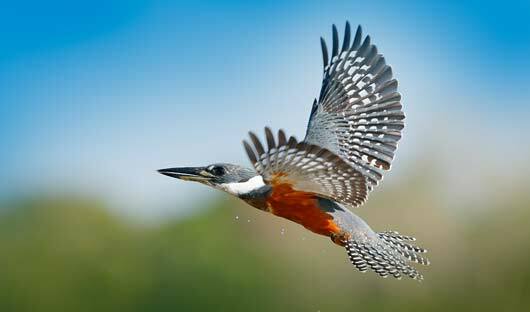 As you leisurely make your way back you will have the opportunity to stop and watch different birds as opportunities arise. 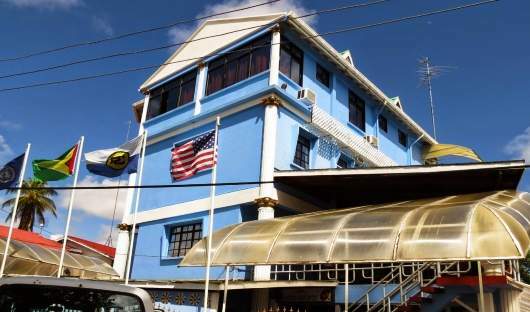 Kanuku Suites offers modest style accommodation in a quiet, residential community on the outskirts of central Georgetown. The ensuite rooms are air-conditioned and have high speed internet access. The hotel is a stone’s throw from the street that never sleeps: Sherriff Street, and within walking distance of restaurants, supermarkets, gift shops and the some of the most popular entertainment hot spots in the city. The city centre and commercial district are 5 minutes away by taxi. Begin your day with an early morning transfer by road along the East Bank of the Demerara River which will take you to the Arrowpoint Marina. From the Marina, a short boat ride across the Demerara River to the mouth of the Kamuni River will take you onwards towards Pokero Creek, a smaller “black water” tributary which is quite a contrast after the muddy brown waters of the Demerara. The dark shimmering water leads you through a corridor of overhanging vegetation and as you enter the Santa Mission Amerindian Reserve, the habitat changes from forest to more open savannah and seasonally flooded swamp. Ringed Kingfishers and Greater Anis, together with other riverside birds, are commonly spotted here. You will visit the village of Santa Mission, which is a community of Arawak and Carib Amerindians. Afterwards you will make your way to Arrowpoint Nature Resort which is found within the Amerindian reserve of Santa, situated overlooking the savannah and the Pokerero Creek, and surrounded by rainforest. Enjoy dinner served under a canopy of stars with the delight and sounds of the night creatures. When the sun goes down, the beach is transformed into a festival of lights provided by traditional mounted flambé and an outstanding large bonfire. An indigenous atmosphere is created as a mouth-watering three course dinner is served buffet style on the beach. After dinner enjoy an adventurous night walk through the dark jungle trails with your own head lamp (provided by resort) and experienced local guide. For the return journey you will paddle along the dark waters of the creek which will surprisingly become nearly transparent as you look into it with your head lamp and the colourful eyes of the marine life looks back at you. Before you enjoy a beautiful breakfast, take a canoe out to bird watch along the creek. In the palms you may be lucky enough to encounter the strikingly beautiful Point-tailed Palmcreeper. You may also see Sungrebe, Sunbittern, and a myriad of hummingbirds including the Black-throated Mango and Green-tailed Goldenthroat. 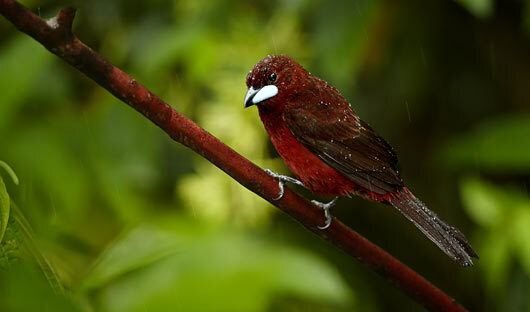 But the bird that everyone wants to see is the magnificent Crimson Topaz which appear along the streams. 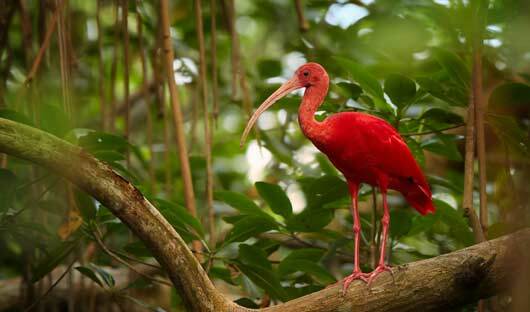 Continue bird watching into the late afternoon, keeping an eye out for flocks of Red-bellied Macaws crossing the sky en route to their roosts, and perhaps seeing an evening gathering of euphonias and other tanagers in low trees of the clearing. Sapphire-rumped Parrotlets occasionally roost in the area. You also have the choice of hiking along the vast and interesting trail network systems. There are three 4 hour hikes that start and end at the resort. You can do the complete hike or just part of it to suit your fitness and interest. All of the trails vary in difficulty and are all located in the jungle and will take you through areas of wilderness for many kilometres, passing isolated Amerindian dwellings along the way. There is also the option of various levels of mountain biking to enjoy. 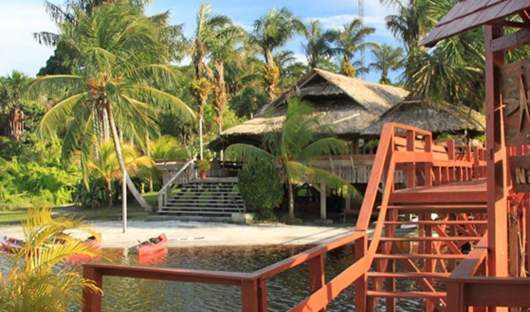 Arrowpoint Nature Reserve, found in the Amerindian reserve of Santa is a lodge surrounded by a variety of habitats, including an open grassy marsh and scattered stands of Moriche Palm and a fairly tall sandbelt forest. There is ample trail systems which you will make full use of and additionally there is the attractive option of birding by canoe along the more peaceful stretches of water upstream. All rooms have full bathroom facilities with fresh running water. After breakfast return to the Arrowpoint Marina via boat. Be picked up in a private transfer to be taken to the airport for your departing flight. You can enjoy as many or as little inclusions as you would like during your birdwatching holiday. 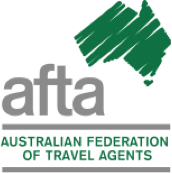 Contact the experts at South America Travel Centre today on 1300 784 794 to see what your tailor-made itinerary could look like.